Are You Set to Follow the Original Design for Your Life? When you embrace the notion that who you are is rooted in God’s great plan for your life, you can go through all of life’s mishaps, disappointments and turmoil with inner peace and strength, that is not your own, but of that same Father God who has designed you to thrive. You are not an accident. None of us are. The unchangeable circumstances of your birth, your parentage, heritage, nationality were all pre-designed. God knew you before time itself. And He knew what He was doing when He created you. Let me say that again, God knew what He had in mind about you when He created you. Whether you believe that or not, know this – you were especially designed by the Master Creator Himself who placed the stars and all the heavens in place with just a flick of His fingers. Yes, you are special. Because unlike the heavens, God crafted you with His very own hands, then He breathed life into you. And with the same careful thought and deliberation, God lovingly knit together the best pieces of you that makes you unique in all of creation. So while you were in your mother’s womb, He already knew how wonderful you were going to be, and the extraordinary life that you were meant to have. Even from that multiple cell organism embryo that was the beginnings of you, He has already meticulously planned the best life for you. I have a confession to make. Yes, I actually talk to myself in front of a mirror. Years ago, I bought this beautifully crafted Balinese mirror hanging on my hallway. That’s my special self-affirmation mirror. Whenever I get the blues, or when I feel the weight of the world on my shoulders, I stand in front of that mirror to tell myself again how God sees me at that very moment. That’s when I start quoting the Bible verses of what God says about me, back at me. To remind myself of WHO I AM and WHOSE I AM. It doesn’t matter how messed up I feel when I stand in front of my mirror. I let those words that God wrote about me wash away the mess and start thanking God. My spirits are lifted and I could stand tall again by the time I walk away from that mirror, usually bursting out with whatever praise song comes to mind. You are awesome! You were created for extraordinary! Always remember that! Go ahead, take a moment to look at yourself in the mirror and say to yourself – I am awesome! I know that all this could be mind-boggling for you right now. So let me give you an example that you could easily relate to. Think about this for a moment – within the ordinary shop-bought egg, lies all the components for the chicken. Eggs are known as the world’s perfect food as within its shell contains the highest biological value for life-sustaining protein. In time, and with the right environmental conditions, that egg gets transformed into a walking, breathing, life-giving chicken. All the good stuff which turns the egg into a chicken were all built into the egg from the word go. Apart from its role in the eco-system, the egg was designed for a specific purpose. In the course of its natural life, the chicken gets to fulfill its purpose – to produce more eggs just like it and to eventually grace someone’s dining table. Within you lies everything you need to live well, to thrive and have an extraordinary life. That’s how you were designed by the Master Creator. Try it. quote these verses back to yourself in front of a mirror. Perhaps something happened to you that makes you feel otherwise. Or maybe things just didn’t turn out as you planned, so now you’re just chugging along where you are, feeling helpless and hopeless. God’s divine plan for each and every one of us is to flourish. He has designed you to do just that. To go forward, you need to start from what you already have. Just like that egg, what you need are already right there. Your genius and brilliance, and all that makes you unique in all the world, have always been there. 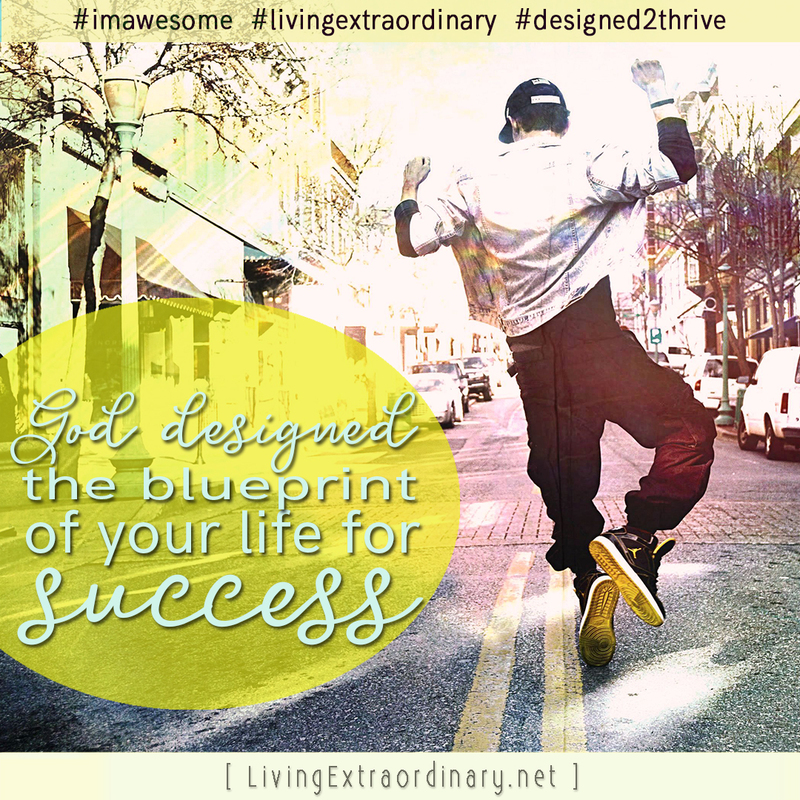 God deliberately designed the blueprint of our lives for success. Knowing that whatever you need to live well and do well was built into you from the time you were born, should keep you motivated, compelling you to go for that extraordinary life that was specifically meant for you. Your extraordinary life is the outworking of your best self that is already within you. Your best life is just waiting for the best you to emerge. CHECK IT OUT. This is What the Bible Says About You.